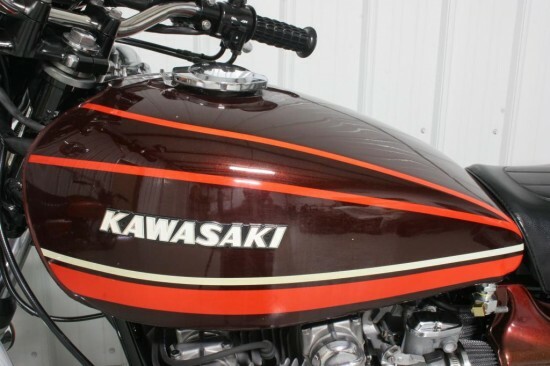 The muscular Kawasaki Z1 almost started its life as an “also ran.” It must be frustrating to spend years working on a new motorcycle [Codename: “New York Steak”] in secret, only to have your rivals beat you to the market by the narrowest of margins. But that’s exactly what happened to Kawasaki when the revolutionary Honda CB750 was introduced just ahead of their own 750. So what to do, now that Honda had stolen their thunder? They knew that to continue on-course and introduce their own 750cc four-cylinder right after Honda would have their range-topping motorcycle looking decidedly less exciting. 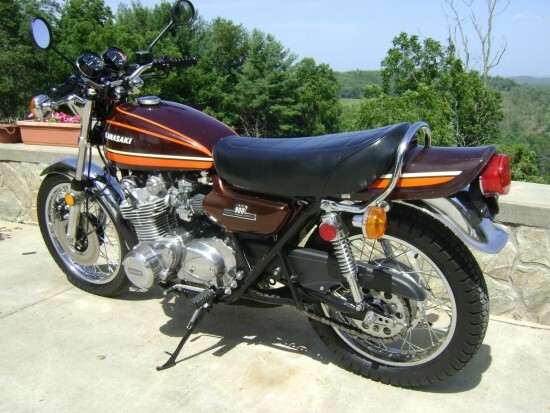 So they bided their time and introduced the Z1 in 1973 figuring if they couldn’t be first to market, they’d be the fastest bike on the block. Thinking that “bigger is better,” their 903cc four made 82hp and could push the bike to a top speed of 130mph. The new Z1 was king of street and strip and, if you wanted to go fast this was the bike to have. Handling was decent as well, although that was never really the point with this bike. Nice examples are very rare today and steadily increasing in value, because so many were raced, crashed, abandoned, blown up, and turned into post-apocalyptic biker gang machines… Bit of film trivia: almost all of the motorcycles used in the original “Mad Max” were Z1’s donated to the production by Kawasaki. This one, however, combines original paint with an otherwise thorough mechanical restoration and looks to be one of the nicest, useable examples I’ve seen in a while. Here is an absolutely stunning 1974 model Z1 with a very low VIN. It is number 325 off of the assembly line for the 1974 model. This bike is such an early model that in fact it was actually manufactured in July, 1973. The VIN on the frame, engine, and title match as they should and it has a clear South Carolina title. I have owned this bike for several years now and it has just had a recent restoration. Everything on this bike works as it did when brand new. The engine runs perfectly from idle to redline. The engine does not smoke and there is no abnormal noise. This bike handles great and accelerates quickly with lots of power. The frame is straight and never altered. Without a doubt the successful bidder will enjoy owning this beautiful motorcycle! 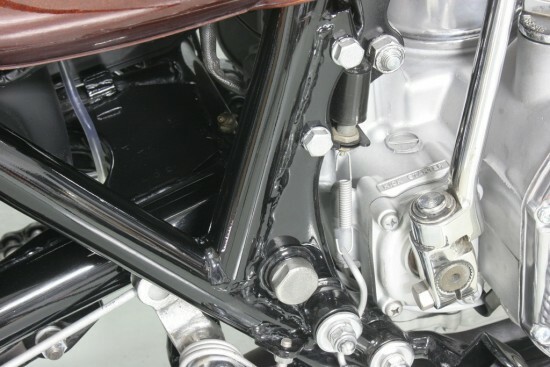 This bike comes with a very rare period correct Pops Yoshimura 4 – 1 header. This header was on this bike when I bought it. This highly sought after header is in exceptionally good condition. It is one of the early Pops Yoshimura headers with brazed on collars on the head pipes, indicative of when he first got started. Beautiful header! Awesome sound! I can install a new stock reproduction exhaust if your country requires a stock exhaust system due to import regulations, (for an additional fee of course). 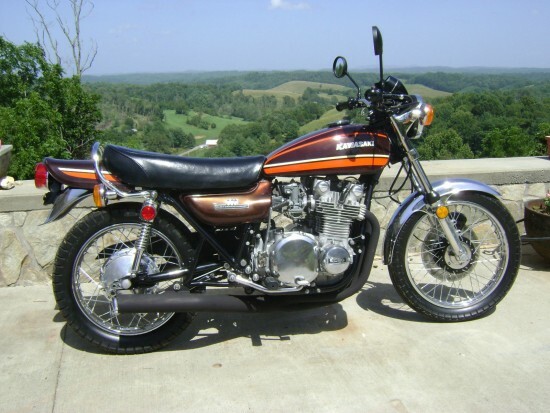 The Kawasaki Z1 came new from the factory with Dunlop Gold Seal tires, F6 front and K87 rear. I was fortunate enough, (and with enough cash) to obtain a set of Dunlop Gold Seal tires from a 1973 model bike that was salvaged in 1973 with less than 500 miles on it. These tires have been stored in climate control all these years and they are still soft and pliable with no cracks and no defects! These tires are unobtainable today. This bike comes with original Dunlop Gold Seal Tires as it did when it was brand new! 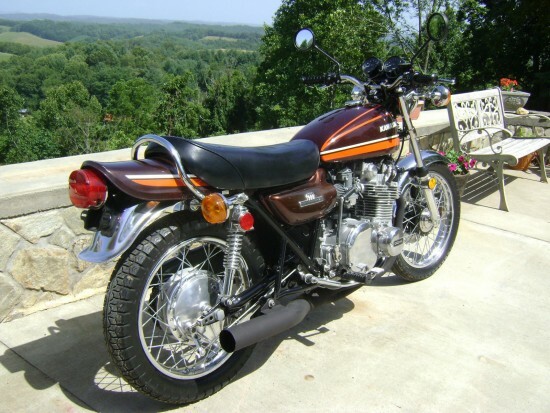 This bike received a thorough restoration and meticulous attention went into every detail. Nothing was rushed and nothing was overlooked. This bike was in good condition before the restoration, (not rusty abused junk). Every effort was made not to over-restore this bike. The tank and body set are original paint with light patina. Most parts on this bike are original including all of the correct date codes. I have hundreds of photos that document every detail of the restoration. In fact I will include a nice PowerPoint slide show of the restoration. I’m a sucker for good-quality videos like the one included here, although the “Hawaii 5-0” music might be a bit much. You can hear the screaming exhaust perfectly well over the music so you know the seller has their priorities straight! 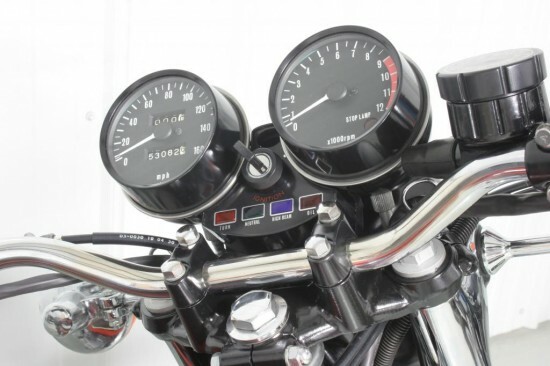 There’s quite a bit more information over at the original listing, along with additional high-quality images, so take a look if 70’s superbikes get you revving. This is the nicest one i have ever seen. I Rode one around sometimes when NEW in 1975, WHEELSTANDED IT in Front of a HigHway Patrolman’s HOUSE one day, etc.. Exhaust looks GOOD on it..